African Storybook - A Google Challenge Finalist! 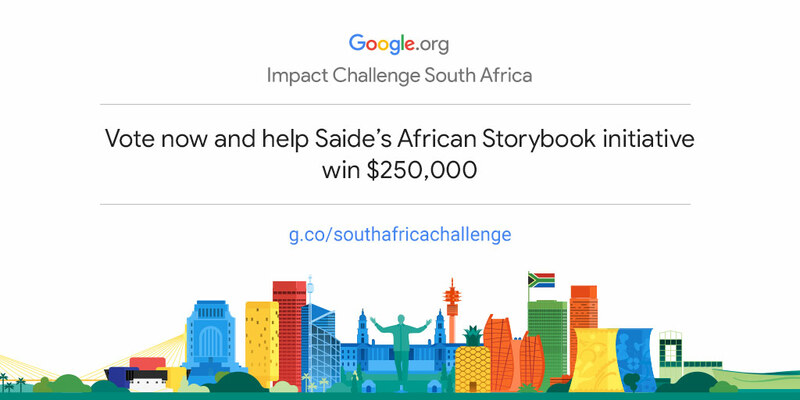 Saide’s African Storybook is one of twelve finalists in the Google Impact Challenge South Africa. This means we have already won USD 125 000. If enough people vote for us, we can become one of the winners, and double that amount. Support us in our effort to make digital storybook development easier for with an offline Story Creation App! Help us and our partners to work with children to write, illustrate and publish stories about their own lives to share with other children across the world! African Storybook has made great progress already: in a space of five years we have over 5000 storybooks in over 160 languages spoken in 25 or more African countries (Niger, Nigeria, Sierra Leone, Ghana, Benin, Cameroon, DRC, Tunisia, Egypt, South Sudan, Somalia, Ethiopia, Uganda, Kenya, Rwanda, Tanzania, Zambia, Malawi, Zimbabwe, Namibia, Mozambique, Botswana, Swaziland, Lesotho, and South Africa). By the end of 2017, we had reached 43 820 educators and 940 226 children. And in 2018, over 80 000 storybooks are downloaded (and presumably read!) per month. Translations and adaptations are done easily, even where bandwidth is a challenge. But people in low bandwidth areas struggle to upload their own illustrations when they want to create their own storybooks. So we are delighted that Google will support us to help people with connectivity challenges, and give us money to create an offline storybook creation App, and Progressive Web Application. We’ve also developed a number of guides and videos on creating, translating and using African Storybooks, the most recent being our Translation Guide. We would like to extend this work and document the method developed by one of our partners in working with children in very marginalised communities to create storybooks about their own lives to share with children around the world. We will test the new App during story development holiday programmes for migrant and South African children in Johannesburg East and with our networks in the ECD community across the country. If we win one of the top prizes, we’ll be able to extend this work to our East African partners too. Voting ends on 25th November!